High fibre, ready-to-eat toasted cereal of oats, mixed nuts and seeds made with all natural ingredients. High in fibre. Low in sugar. Less than 4% sugar. GMO-free. 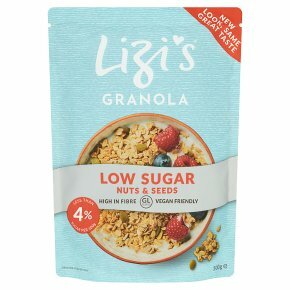 Suitable for vegetarians and vegans.The Health Benefits of Oat Fibre The oats in this cereal contain high levels of the soluble fibre beta glucans. A daily intake of 3g beta glucans has been shown to be beneficial in maintaining normal blood cholesterol levels and so reducing the risk of developing coronary heart disease. One 50g serving of this cereal will provide 1.4g beta glucans, 46% of the beneficial daily amount. How to Use Ready to eat with milk, fruit juice, yoghurt or add to fresh fruit. Use as dessert topping or eat straight from the pack.